Handspun socks? I made it! Ok, so I tried to take a nice photo my socks fresh off the needles, but failed. I partly blame my dog, who tried to eat my toes in the process… But here they are, my first ever handspun socks! And I love them! But, I know the yarn is a 3-ply, I used 2.5mm needles, and the pattern is called Monkey Socks by Cookie A. It has this nice pattern throughout the socks that is easy to remember. The yarn is a bit busy, and the pattern is a bit lost in the yarn, but it kept it interesting. So totally worth it! It´s been a long time since I´ve done any spinning. But the other day I had a look at one of my favourite spinning fibre sites Hilltop Cloud, not because I need fibres, – I have plenty, but because I needed inspiration. And it came! I instantly fell in love with two braids. One in gorgeous pink and purple tones with splash of other colours as well, and one in the colour of early autumn. So I ordered those. Because I couldn´t resist. The pink one is a 50/50 Merino and Tussah Silk blend, and the green one is 75/25 Superwash BFL and Ramie. They are both supersoft! The pink was wonderful to spin, – I haven´t tried the green yet, but I suspect it will be equally lovely. I started off with the pink braid and my Ashford E-spinner last weekend, and by the end of Sunday, I had my first yarn in months! I love that feeling! I decided to make a 2 ply yarn, so I spun two bobbins with 50g each. It didn´t seem like much yarn on the bobbins, but I turned out to be a good deal of yarn! I felt a little out of practice, but I managed to end up with a lovely and soft skein of app. 450meters. I don´t have a specific plan for this skein, but I´m sure I´ll think of something at some point. Right now, I´m just so happy to be in the spinning game again! I had hoped to do some spinning this weekend, but I´ve done some painting around the house, and we had a snow blizzard that made the power go out, so we ended up reading by candlelight and curling up in front of the fireplace instead. Whitch was just as cozy as spinning! Late last night I decided to put my knitting aside and get out my brand new Turkish Spindle from Kjerringrokk. My spinning guru friend Marianne was so kind to buy one for me at a spinning retreat she went to earlier this year. I could have bought one online, but since she has lots of experience, I really wanted her to find me a good one. And she did! Just look at that fun little turtle shell shaped ball! I´m so excited! So. Can you guess what I´m up to now? I just have to eat some breakfast and then I´m going to find one of the polwarth sample box braids from Greenwood Fiberworks that I bought in February. I´m spending my Sunday with my turkish love. It is finally done! A shawl I started working on in September. The reason why it has taken quite some time is not because the pattern is particularly hard or boring. The reason is because I spun the yarn myself. It all started with 4oz of Polwarth Combed Top from Phonenix Fiber Co in the colorway Cherry Blossom. Once I had spun that I knew I had to make a shawl. I searched for a pattern that could fit, and got a lot of help from some of my podcast viewers. I ended up choosing the pattern Piper´s Journey by Paula Emons-Fuessle. Once I had decided on that, I wanted some neutral yarn to make the applied edge. So I bought some undyed Polwarth from Hipstrings and spun that too. The shawl hibernated while I got around to spinning, plying and caking that. Once that was done, I had to get the urge to continue knitting on it. And finally the urge came! The result is a huge shawl, knitted a bit bigger than the pattern says, because I wanted to use as much of the colored fiber as possible. 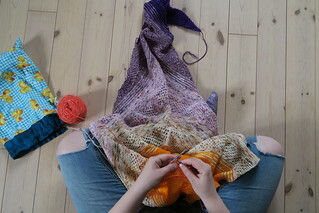 The shawl is knitted on 4.0/US6 Knit pro Nova interchangeable needles, which worked well with this project. The total weight of the shawl is app. 190grams. For those of you who is wondering if you should try spinning, I have to say that you really should! The act of spinning is really meditative, and the feeling one gets when knitting with a handspun yarn that YOU made is hard to describe! Such a great experience! My name is Lena and I´m a teacher by day and a craft addict and total book nerd by nigh. I love knitting, sewing, spinning and pretty much what ever tickles my fancy. I live in the Norwegian countryside with my boyfriend, our dog Gustav and a bunch of chinchillas. I often find myself in deep conversation with the dog. I´m writing in English, but feel free to comment in whatever language you think I might understand.